Ankara is making it harder to bet against the lira, but overnight swap rates of 700 pct also make hedging prohibitive. Probes by the bank watchdog mean a research drought. Investors will dump Turkish assets rather than stay exposed, especially when experts are opting to keep mum. The central bank has hiked rates more than markets expected, a welcome sign of independence after attacks by President Erdogan. The move may avoid a currency crisis, but Ankara’s political and economic vulnerabilities endure. And tensions between bank and state may get worse. The Bridgewater founder made positive returns in 2008 when few other asset managers did. Today, he tells Breakingviews, he worries about the U.S. deficit and debt pressures that could soon go critical. The risk of populism and conflict sounds eerily like the pre-war years. An emerging markets rout has pushed the rupiah to its weakest since the 1998 Asian crisis. Policymakers, who have until now been laudably proactive, appear rattled. But threats against speculators are less helpful than higher interest rates and reforms that encourage investment. The pro-market leader of Latin America’s No. 3 economy has been laying the basis for long-term prosperity. But inflation, drought and soured investor sentiment threaten his efforts. A new run on the peso, and desperate rate hikes, make a return of his Peronist nemeses more likely. 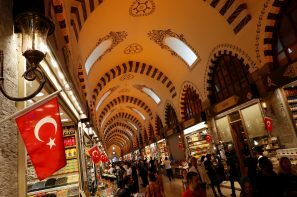 The currency hit a record low against the dollar after the United States said it was reviewing Turkey’s duty-free access to its markets. President Tayyip Erdogan has alienated investors. The tougher he talks to the world’s largest economy, the more they’ll punish Turkish assets. Bond yields and the yen rose after Reuters reported the central bank was debating whether to scale back monetary stimulus. The move would be good for bank investors. But the scale of the market reaction and economic reality will make it hard for Governor Haruhiko Kuroda to act.